With weekend dates getting more pricy with the increase of almost every other thing, it seemed like a must try when my ears got news of the $1 Thai boat noodles. The bf and I, being avid lovers decided to give it a try. It was fully packed on a Saturday night even when we reached at about 9PM. Apart from the signature $1 boat noodles which draws most of the crowd to this little restaurant, they also have other dishes up for orders. We opted for the Mango salad which is approx $7 and tasted pretty good. Loved the blend of the condiments for the salad sauce. Thai ice tea which we found to be pretty diluted. The original boat noodles ( ~$1) which swung to the sweet side and wasn't particularly to my liking. The dried noodles ($1/$1.50) featured peanuts and pork ball, which was slightly better, but I just don't really fancy the idea of having my noodles being too sweet. It seemed to be a really simplified and budget version of Phad Thai. Sliced pork, which turned out to be boiled pork done the shabu shabu way. Pretty simple and bland on its own, but it tasted quite awesome with the fish sauce and chilli blend which you can help yourself to near the front of the restaurant. This was pretty much our order apart from the mango salad as our main aim was only to try the flavours. Haboured the highest hopes on the Tom Yum boat noodles ($1.50) but it seemed to be nothing more than just the tom yam powder mixture, largely similar to those instant noodles packets. It is almost one spoonful of kuey teow and condiments costing $1-$1.50. If you multiply it by 3 for a food court price, it is pretty pricey for the little portion! It's an interesting concept but we were not bought over by it. They do have their own share of fans as we spot tables (of 4) with stacked up bowls of what it seems to be over 30 bowls. 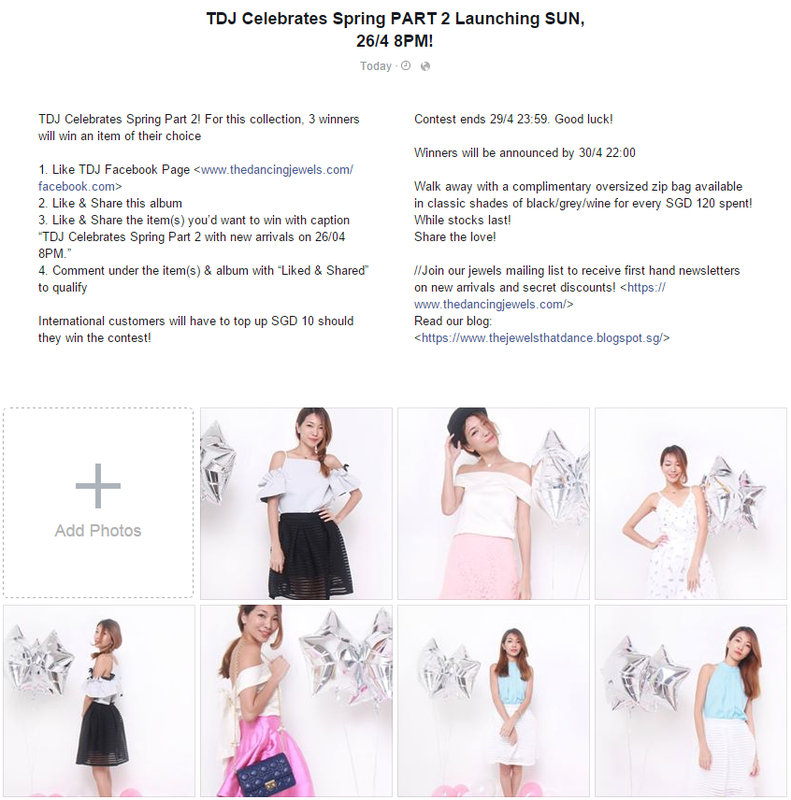 Hello ladies, we hoped you love the Part 1 of our Spring celebration! Complete part 2 with pastel palettes of whites, pinks, blues. In feminine curves, Henderson scallop dress in white plays with the whites with scallop hemlines and bustier and laser cuts. It adds a pop of texture to the other wise plain white dress. Brighten up your day with Fuschia lady skirt with it's topping of hot pink in polyester blend. It's folded creases creates an extra flare for the skirt. Crafted with pocketed quilts, pearls and goldware, Strafford quilted bag is one of our favourite picks from this collection. The sleek pockets of soft leather adds the additional 3D concoction, sealing the look with elegant pearls along the goldware. Top coated with goldplating, this classic piece is sure to have a space in our own collection. We also have it in the classic black flavour. Showering you with delicates, Peach kisses skirt dedicates a soft fushion of laces and mesh overlay. It's demure cuts and pastel settings can't help but remind us of marshmallows. For the perfect weekend date, pull back your hair into a sleek ponytail, choose that rougue red lippe, and frolick in our Embroidery cut Ashley dress. Complete with an inner tube, this white number provides sufficient coverage yet revealing enough teasers through it's laser cut embroidery crafts. A baby shade addition to the Cale halter top, we couldn't resist this basic baby blue with it's elegant cuts. We love the pastel palette complete with the upcoming Vera Skirt. It's defining streaks in alternating patterns amphs up the otherwise plain design. And because we can't get enough of offshoulder designs, Cherish ruffled top took our breathe away with it's simple cuts, yet eye catching ruffle drape. It's runched up shoulders adds the extra layer of chic-ness, allowing it to score both the corporate and casual arena. Complete the look with Vera skirt in black, we love these neutral hues of feminity. To combat the blistering sun these days, keep cool with our Snowfall lace offshoulder. It's flutter out scallop sleeve injects an unmistakable dosage of feminity. Pair it with Lavender shorts to whisk you straight into the lavender fields in it's it's floral prints. To inject some patterns to your jumper collection, we have Sonja stripe jumper with it's nononsense corporate stripes, ending with a wide flair cut. Last but not least, should you prefer something softer, snuggle up with our Fur clutch in baby pink. An instant conversation starter in bubblegum flavour, we love this fully lined fur baby. Join our facebook giveway to win an outfit of your choice! See you 26Apr'15 8PM for our Spring Part 2! Down to the last 2 days of Taipei! 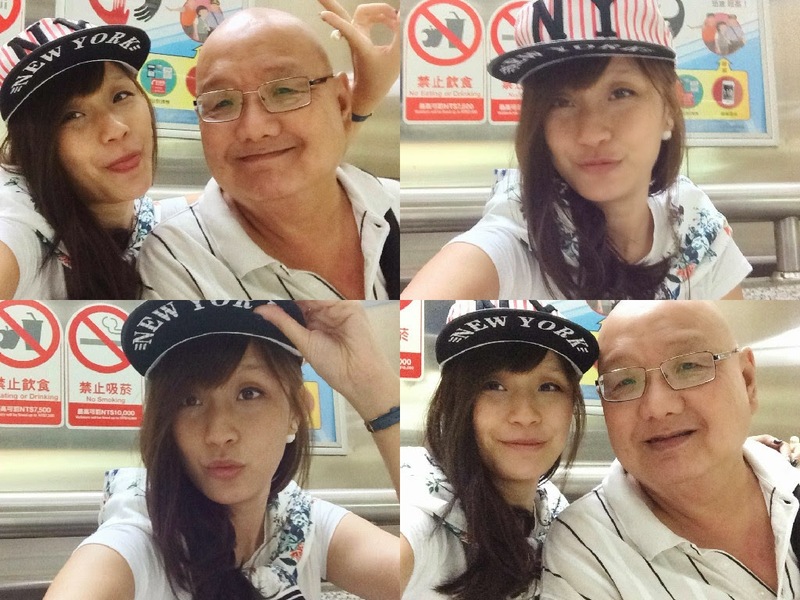 Started the day with a series of camwhores with the papa on the way to Jiufen. As advised by our hostel, we opted for the method to take the bus from Zhongxiao MRT to Jiufen. In Taiwan, do it the Tai-mei style. Pass? Follow the signs and keep towards Exit one. Right beside the building stands a small bus stand listing the available bus services. It doesn't have a proper bus stop but you shouldn't miss it as they would be people usually in the queue. Seats are pretty spacious and you would be assured a seat as the bus doesn't seem to allow people to stand along the journey. In narrow winding streets atop the mountains, you know you have reached your destination, Jiufen! A cultural snippet of Taiwan's past and now a tourist attract, Jiufen now retails many goodies and souvenirs for tourists to pack home, peanut candies, fruit jellies etc. If you are swinging by, remember to keep some cash for the food. Natural volcanic rocks that we first got our pieces from via our previous trip in Korea, Dad was elated to be able to find similar rocks here. Don't belittle the perforated rocks, they work wonders and scrubs off the dead skin under our feet, at only 60NTD ~ 2.50SGD. And they work wayyy better than those exfoliators from Watsons. If you are a fan of quirky candies and souvenirs, don't miss this store here. Similar to the one at Ion B3, get your fix now at a cheaper price. We had desserts at 赖啊婆 , traditional glutinous balls, which we found sadly to be overated and nothing much to be raved about. The boy suddenly disappeared into the crowed and reappeared with these green packets. Supposedly matcha/green bean glutinous kuey with 卤肉。The glutinous rice didn't have an overwhelming taste to my delight and its pretty interesting how this combination worked out. The taiwanese really does glutinous dishes pretty well! Hop onto bus 827 that brings you to the Ruifang station. If you are in need of wifi, register as a guest at the Visitor information center with your passport details to get one hour complimentary! Located opposite of Ruifang Station ( you will have to walk quite a distance) , is a local food street, which seems like a hawker centre. Situation within are many stores which you can feast upon before hopping onto the train. We were not hungry then and thus didn't manage to try anything here. Should you not have tried Yonghe, there is one around the corner of Ruifang station, but we found it paling in comparison to the one at Ximending. After we have reached Shifen to light the lanterns, it's time to pen your thoughts. Apart from the lanterns, there doesn't seem to be much to do. It turned out that the train fare costed more than what we have paid for, but fret not as you can just top up at the counter should you travel token fail to tap you out. Showcasing my hello kitty tumblers from 7-11. I really do love the adorable promotions in Taiwan! Another of my favourite apart from the milk tea from the local 7-11s is the Peanut candy. The nuts are the right size and with the correct level of brittleness, just the way I like it. And with it costing only approx SGD 1, do try it if you are a fan of peanuts! Down to the final day of Taiwan which we have to return to Singapore on the same day, we tried the Duck noodles located just a stone's throw away from our hostel. However, it seems pretty average to us and nothing to rave about. Completed lunch with some traditional beancurd. With the help of our hostel who called up the Airport Transport bus to indicate 3 headcounts at the pick up point near the hostel, we saved ourselves a sum from taking the taxi (900NTD). The down side is there's no bus stop or sign indicating where to stop, but it's generally along the mainroad as you turn to the right of the Junction from 明日Hotel. The bus ended up stopping right outside the Hi-Life logo. The bus scoots off on the dot after picking the passengers so don't be late! Do note that you might have to disembark halfway to change to the below pink and more spacious bus at a stopover, also the place you will be purchasing your tickets at 140 NTD per head. Seats are pretty spacious and comfy and it brings you to the doorstep of the airport. And that bids the end of our 8D7N trip! Sorry the updates took so long, we hope you find this helpful!